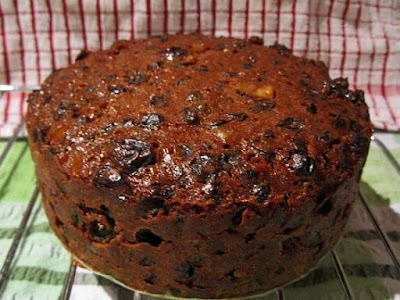 Fruitcake was a staple at Christmas time for my family. There was always a couple pieces in the freezer year-round, leftover from Christmas. Fruitcake was a topic that arose at the Heritage Foundation's recent Mummers Memory Mug-Up. Participants discussed how at Christmastime there was always dark fruitcake and light fruitcake. It was a treat that mummers would receive from their hosts when visiting from house to house. In a large saucepan, combine brown sugar, hot water, butter, chopped dates, raisins, cinnamon, allspice, cloves, mace, nutmeg. Bring to boil for 5 minutes. Remove from heat; let cool. Add egg, baking soda, flour, cherries, mixed fruit, rum, lemon almond extract and vanilla. Combine together. Place in 9 or 10 inch greased tube pan at 300F for 2 hours. Do you have any memories of fruitcake?